We have already discussed Constant Prepayment Rate (CPR) and Single Monthly Mortality Rate (SMM). Another prepayment rate is the Absolute Prepayment Speed (APS), used mostly for securities backed by auto, truck, and RV loans. The acronym for Absolute Prepayment Speed (APS) is also referred to as ABS, which is confusing because ABS is also the acronym for Asset-Backed Security. I am using ABS in this post and in the workbook “CPR-SMM-ABS”. Automobile asset-backed securities normally use ABS, rather than CPR, due to the shorter term of auto loans. An auto loan, unlike a long-term mortgage loan, typically starts off with higher principal payments, so they amortize quicker. Auto loans are less sensitive to interest rate swings, because there is normally not a big enough savings to entice someone to refinance. Both CPR and ABS use SMM for the monthly prepayment rate, the difference is that CPR is a percent of the remaining balance, where ABS is a percent of the original balance. This makes the SMM rate for ABS increase each month. 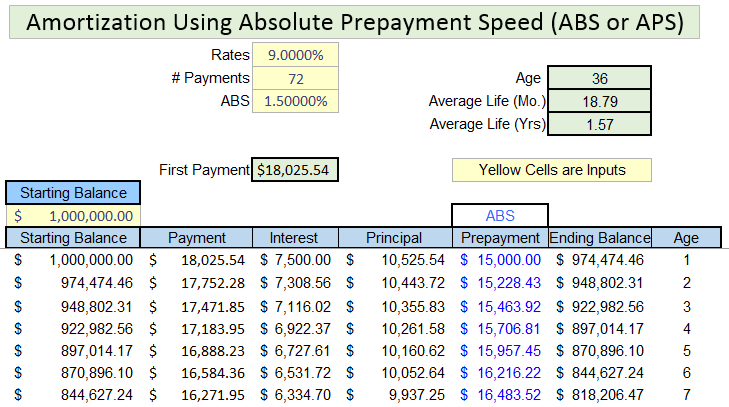 You will notice on the conversion sheet that the age of the loan (in months) is required for ABS. I have never worked directly with auto loan securitization, but I assume that if I wanted to use ABS prepayments on a new pool, it would look something like below. If you disagree, please let me know. Background: over 40 years in investments, asset/Liability management, banking, securities trader. Worked for: California Credit Union, WesCorp, CalFed S&L, Crocker Bank, Carroll McEntee, Federal Home Loan Bank Board (D.C.), Western Asset Management, Security Pacific National Bank. In the ABS tab, in the payment calculation, you repeat one part of the formula twice. You can take it out, which will make the formula less cluttered and it will still work. Thank you for this spreadsheet! Thanks for pointing that out. The only thing I can think of as to why the double formula was that the original version of this spreadsheet was created using an earlier version of Excel. Back then, there was no IFERROR function. Errors were handled with the ISERROR function and were written something like =IF(ISERROR(A1+A2),”0”, A1+A2). In other words, the formula had to be written twice. When I updated the spreadsheet in a later version of Excel and converted it to using IFERROR, I must have left part of the old formula in that was not needed. © Copyright 2019 Excel@CFO. Powered by WordPress.